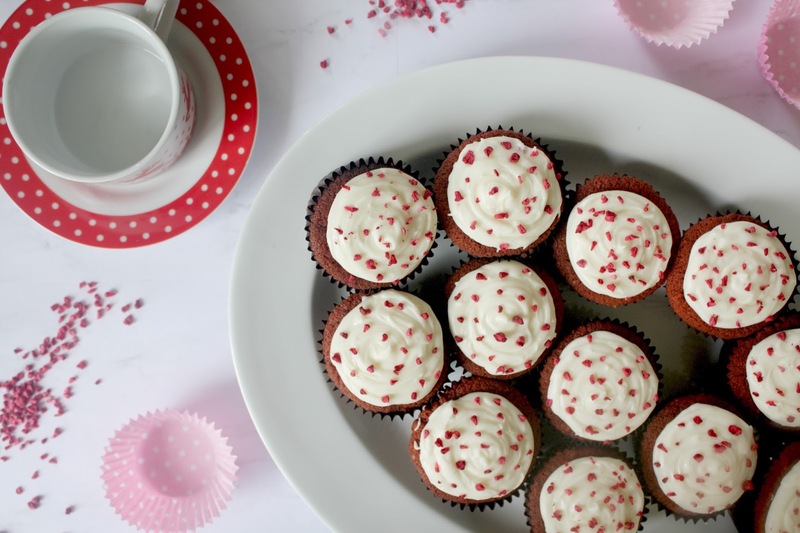 Complete with cream-cheese frosting, and raspberry pieces, these red-velvet cupcakes are such delicious treat for Spring, and who doesn't love a brightly coloured cupcake? My sister and I originally made these for Mother's Day but they went down so well I'm sure we'll be baking more batches throughout the Spring. Hope this inspires a bit of sweet baking for you today, and let me know in the comments what other recipes you'd like to see on my blog next. 2. Add the eggs and and beat again, then pour in the buttermilk- little at a time - and sift in the flour and cocoa powder until all is combined. After this it's time to add the red food colouring, which you should fold into the mixture until the batter forms a vibrant red colour. 3. Set aside, and in a small cup add the bicarbonate of Soda and Vinegar, then fold this through the cake mixture in the main bowl. Divide the mixture evenly among the cupcake cases and put in the over for 20-25mins. As they're red, it will be harder to tell when the cakes are cooked so bake until a skewer inserted into them comes out clean. 4. Meanwhile while the cakes are cooling, make the icing by beating the butter in a large bowl until smooth, then adding the cream cheese and sifted icing sugar, and mix until combined. 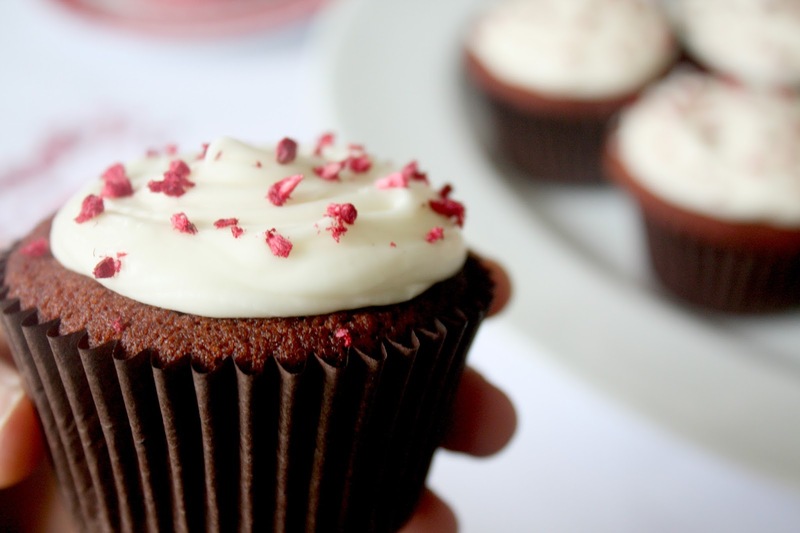 You can choose to pipe the icing depending on the consistency, or smooth over the cupcakes, then for a finishing flourish sprinkle with the freeze dried raspberry pieces. 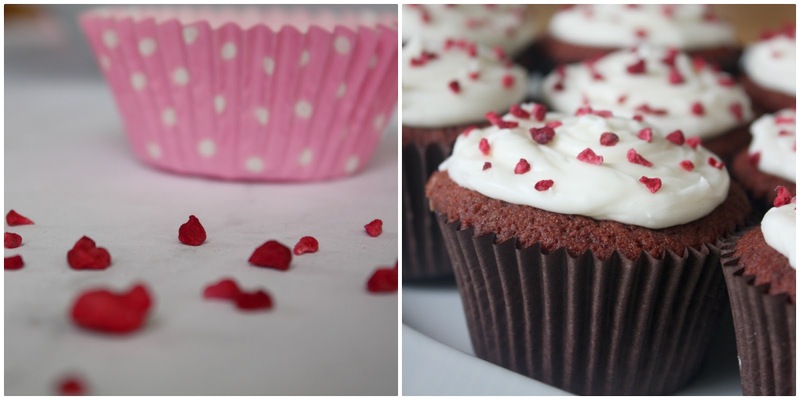 QOTD: WHAT'S YOUR FAVOURITE CUPCAKE FLAVOUR? Red velvet is my favourite kind of cake! They're so yummy and your photography is so pretty! Thanks for sharing your recipe, I definitely want to try and make these. They look delicious!! I haven't had cream cheese before so I'd be interested to try it! 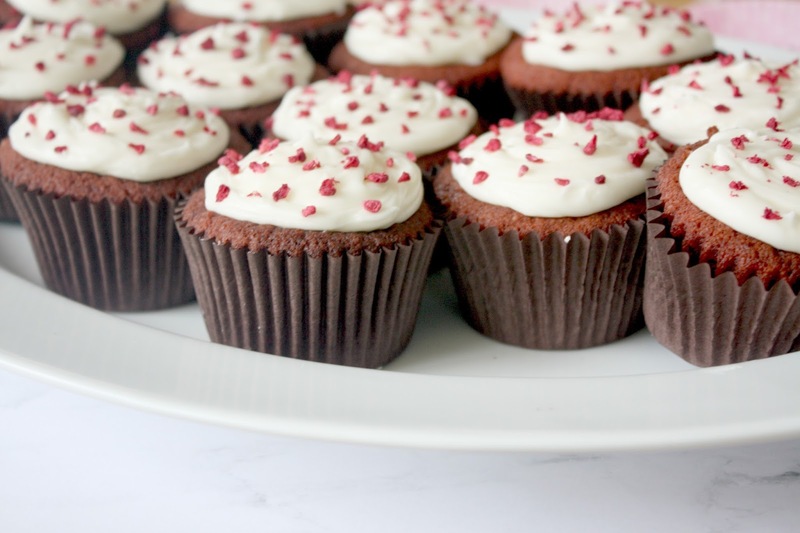 These cupcakes look so yummy! I like the little raspberry dried sprinkles on top! I'll definitely have to try this recipe out! Thanks for sharing! I love red velvet and I love baking but I've never baked any red velvet cakes myself. I'll 100% have to try this recipe because I've been wanting to try and make some for a while now! ps your photography is lovely in this post! omg, girl, these look bloody beautiful and delicious! You’re a pro! These look delicious. I definitely need to try out this recipe! 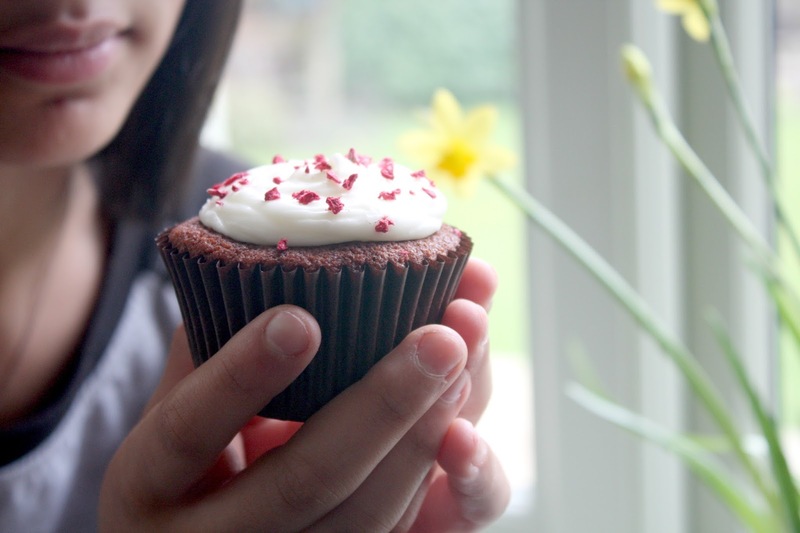 Oh I do love s nice cupcake and I can easily swap the ingredients to make them dairy free. I shall save this to try later. 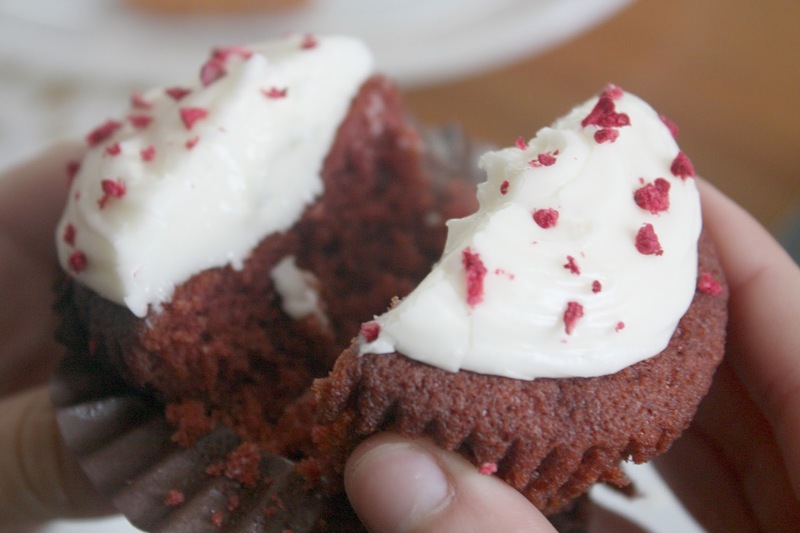 Omg we have not had a red velvet in so long! Will defo be taking inspo from this and making these when we can! These look gorgeous!! I am really craving sweet things right now. I may have to make these at the weekend! I will definitely be having a go at making these, you can't beat a bit of baking!